glasseyedave	The Gospel the church refuses to believeArminianism, Calvinism, Can a Christian live without sin, conservative, Did Paul struggle with sin?, Gospel, Grace, The gospel according to the gospel, The Gospel the church refuses to believe, What does Romans chapter 7 teach? Does Romans chapter 7 teach that a Christian will always struggle with sin? Is Paul confessing he has a nagging problem with sin? 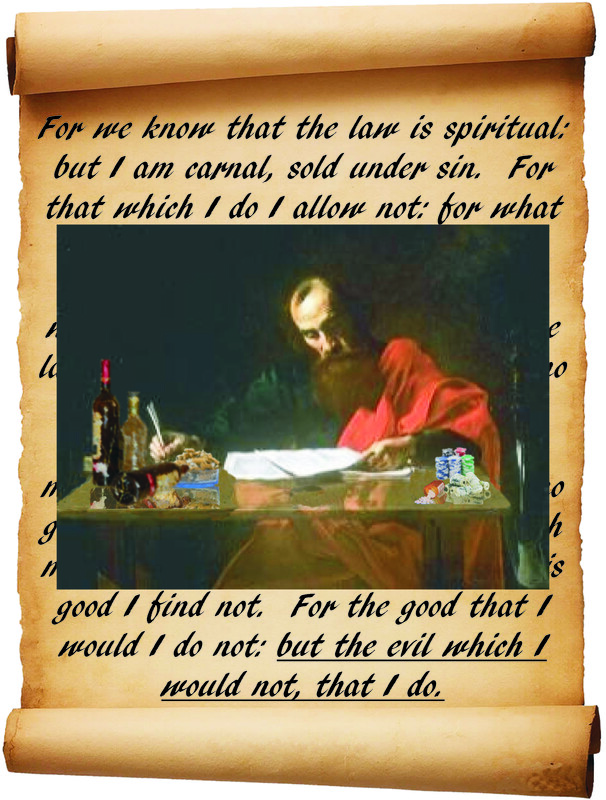 My graphic shows a Paul who can not say no to sin. He is a drunk, abuses prescription drugs, gambles and is a chain smoker all because he does those things which he doesn’t want to do. That is, according to theologians. What is Romans chapter 7 teaching anyway? Theological: Do as I say and not as I do. Every person who has made it a practice to study scripture through some kind of higher educational system, such as bible college or seminary, have been taught to interpret scripture by scripture. No scripture standing on its own makes for doctrine. The thought is, by reading scripture in context (understanding how the scripture in question fits in with the rest of the passage it is found in) and having other supporting scriptures from other places in the Bible one can understand what God is saying to us in His word. This is supposed to be the form and practice for those who call them theologians. What we find, however, in theology is the practice of ‘do as I say, and not as I do’ when it comes to Romans chapter 7. They teach and want others to take scripture in context and find other examples of what a verse teaches, but when it comes to Paul and the issue of sin in a believers life, the theologian rips scripture out of context and violates the teachings of the New Testament concerning what being born again means. Does Paul in his letter to the Romans also say ‘do as I say and not as I do’? If one follows the modern thought of Christianity concerning Romans chapter 7, then yes Paul also has a habit of disconnecting himself from what he teaches. Paul in chapter 6 is answering the question, should Christians sin. “God forbid”. The believer is supposed to be dead to sin. The questions is asked, can one who is dead to sin still be alive to sin? Great question Paul. Many theologians answer Paul with a resounding, YES! They use Paul’s words in chapter 7 against Paul. In the eighth chapter Paul teaches that what we believers have in Christ Jesus through the Spirit has made us free from the law of sin and death. Does this mean that Christians are forgiven but not perfect as theologians teach concerning Romans Chapter 7? Or is Paul teaching the believer something else? Therefore, brethren, we are debtors, not to the flesh, to live after the flesh. (13) For if ye live after the flesh, ye shall die: but if ye through the Spirit do mortify the deeds of the body, ye shall live. (14) For as many as are led by the Spirit of God, they are the sons of God. But isn’t Paul only teaching that we are free from the consequences of sin as forgiven but not perfect believers in Christ Jesus? Or does Paul actually contend that believers in Christ Jesus are also faced with the second death, like the unbeliever, if they live not according to the Spirit? Yes, Paul does contend exactly that. But Paul would add that if we are in the Spirit, if we think we are truly His, then we will have fruit of righteousness that leads, in the end, to everlasting life. Surely what I am contending is not the truth of the gospel, or is it? Does Paul really teach that those who please the sin nature will die in their sins? Does Paul actually teach only those who live righteously in Christ through the Spirit have the hope of everlasting life? Why yes he does. Not only does Paul teach this exact thing in the book of Romans, he is more explicit about it in the book of Galatians. Concerning this very subject, he says do not be fooled. I would say do not be fooled by those who preach the forgiven but not perfect excuse of a gospel which does nothing but keep the old man off the cross. Be not deceived; God is not mocked: for whatsoever a man soweth, that shall he also reap. (8) For he that soweth to his flesh shall of the flesh reap corruption; but he that soweth to the Spirit shall of the Spirit reap life everlasting. For Paul the gospel is the good news of Christ who not only has enough grace to forgive sin, but to take away the sin nature. In the first couple of verses in Romans 6 Paul teaches that our old man (sin nature) was crucified with Christ. By the way, this is something we could not do for ourselves. This was God’s grace in action for mankind. Paul also says our old man was buried with Christ. Again, this is something we could not do for ourselves. We were eternally bound to be slaves to sin until Christ killed the sin nature by crucifying the old man who was a slave of unrighteousness. Also, Paul says in these first couple of verses of chapter 6 that just as Christ was raised to newness in life, so now we believers are also raised. Through Christ, the body of sin that was alive to sin is now dead to sin that we do not need to serve sin anymore. If we truly were crucified with Christ, we are free from the sin nature for those who are dead in Christ are free from the sin nature. Know ye not, that so many of us as were baptized into Jesus Christ were baptized into his death? (4) Therefore we are buried with him by baptism into death: that like as Christ was raised up from the dead by the glory of the Father, even so we also should walk in newness of life. (5) For if we have been planted together in the likeness of his death, we shall be also in the likeness of his resurrection: (6) Knowing this, that our old man is crucified with him, that the body of sin might be destroyed, that henceforth we should not serve sin. (7) For he that is dead is freed from sin. For those who only understand grace as forgiven and not perfect, please understand the full measure of grace given to us by God in Christ. The grace of God is killing us on the cross with Christ and now being dead and being buried us with Christ. Christ now being raised from the dead in newness of life, we too by His unmerited grace also rise to newness in life with Christ Jesus. None of this has anything to do with us, but everything to do with God and His love for mankind. This is why scripture clearly teaches (not implied) that only those who live in the newness of the Spirit through Christ (through grace) are righteous as He is righteous. In fact, it is even more bold. It says only those who do righteousness is righteous as He is. These are not the words of Paul, but the words of John. And ye know that he was manifested to take away our sins; and in him is no sin. (6) Whosoever abideth in him sinneth not: whosoever sinneth hath not seen him, neither known him. (7) Little children, let no man deceive you: he that doeth righteousness is righteous, even as he is righteous. (8) He that committeth sin is of the devil; for the devil sinneth from the beginning. For this purpose the Son of God was manifested, that he might destroy the works of the devil. (9) Whosoever is born of God doth not commit sin; for his seed remaineth in him: and he cannot sin, because he is born of God. (10) In this the children of God are manifest, and the children of the devil: whosoever doeth not righteousness is not of God, neither he that loveth not his brother. Understanding God’s full measure of grace does not change anything about Paul’s message of grace of not by works, instead it adds to the full meaning of his message of grace. We were not commended to God because of our works, just as Abraham was not counted for righteousness after he was circumcised, but before the work of circumcision. God’s gift of righteousness to Abraham was not based on works but on God’s grace. The same applies to us who walk in the faith of Abraham. This is found in Romans chapter 3. But unlike Abraham who had the promise we get what was promised to Abraham, even the Holy Spirit. Christ hath redeemed us from the curse of the law, being made a curse for us: for it is written, Cursed is every one that hangeth on a tree: (14) That the blessing of Abraham might come on the Gentiles through Jesus Christ; that we might receive the promise of the Spirit through faith. I could go on and on with scripture but I feel the need to get to the point of this post. What does Romans chapter 7 teach anyway? We have looked at a few scriptures in Romans to show how Paul looked at and taught about the grace of God. We also looked at Paul’s teaching from both Romans and Galatians, that eternal life it is not for those who are forgiven and not perfect. Instead eternal life is for those who walk in the newness of the Spirit and live unto righteousness through the grace given to us in Christ. We also saw how even John believed and taught this, with his very strong statement concerning the fate of those who do evil and those who do righteousness. The reality is, heaven is not waiting for those who are forgiven and not perfect. Instead it is for those who walk in the righteous life lived in the Spirit. After all, we are asked to be perfect as our Father in Heaven is perfect. Understanding all of this, isn’t Paul still confessing his problem with his old sin nature? The answer is God forbid! Because the carnal mind is enmity against God: for it is not subject to the law of God, neither indeed can be. (8) So then they that are in the flesh cannot please God. In chapter 6 Paul states the same thing, that those who follow the old sin nature and are without Christ, cannot do righteousness and cannot please God. Hence, by observing the Law, no one will be counted as righteous. Why? Because the Law does not work the grace of God to set us free from the sin nature so that we can actually obey God and be righteous as He is righteous. Instead the Law came to show us sin and make us utterly sinful. As taught in Romans 7. So sandwiched between these two verses is an explanation of the sin nature that can not please God. Romans 7:14-24 is not a confession of Paul struggling with sin, nor is it this perverted and shortsighted gospel of grace that states, forgiven but not perfect. Theologians have not taken these verses in context with the rest of the letter, nor have they compared it to other of Paul’s letters or other teachings found in scripture. The first part of chapter 7 speaks of the Law and how it brings death, but like a married person whose spouse dies and is free from the law of marriage, so we in Christ are free from the Law. Paul also describes how the sin nature in man works. Then in verses 14-24 he uses his old sin nature (before Christ, while still under the Law) as his example of how not even he could please God and be counted as righteous by observing the Law. Because the Law does not work righteousness in man. This only comes through the life lived in the Spirit. Paul doesn’t leave it there, he ends chapter 7 with glorious praise for Christ who has set him free from the example of the sin nature just as he described. Which example was given to explain the condition of all mankind in the Law apart from Christ. Then he follows up with chapter 8 which is a discussion of living the life in the Spirit, given by grace to us as explained in chapter 6. I personally think there is a rush to believe that Paul is confessing his own short comings, violating everything he and others teach in scripture concerning true grace and the life lived in the Spirit, because we are not living in the Spirit ourselves. Instead of us dealing with the truth of the gospel, that some of us are no more born again than the old man can live in the Spirit. Instead of humbling ourselves and seeking that which was promised through the working of the Spirit, we comfort ourselves with a gospel that Paul never taught. Theologians comfort themselves and mislead the flock. Instead of giving the seeking soul the true gospel and the knowledge of the true gospel to live in the Spirit, the seeking soul is taught grace is being forgiven and not perfect. Just like in the days of the prophets, scripture can say of the teachers of our generation, who heal the hurt of the people but a little. Just like those chosen people of God in Judah, we too are wounded with a grievous wound of sin in the church. Like them, our teachers do not speak to us what will heal the wounds of our lives wrecked with sin. Instead they too heal the hurt of our sin just a little by saying, ‘forgiven not perfect’ and making Paul out to be something he is not, making him out to say something he did not, changing the gospel for something it is not! This is the gospel the church refuses to believe. Will you continue to refuse the offer of a complete grace to save men from their sins and destroy the nature of sin in us. Or will you read the word of God with this understanding and let the Holy Spirit not only open the Word of God to you. Will you let yourself be led by the Spirit to serve God in newness and in righteousness or will you be the seed that never produces a fruit of righteousness. Will you be led by the Spirit or will you never produce fruit in keeping with your repentance to finally be cut down and thrown into the fire. Now you know Romans chapter 7 was not Paul’s confession of sins that he struggled with. True, complete and scriptural grace is in your court. What will you do with what God has done for you? I think it is important to make a distinction here. No we should not go on sinning, and yes, the Spirit of God can give us victory over sin, but we also struggle with our fleshly nature even after we are indwelt by the Holy Spirit (If we claim to be without sin, we deceive ourselves and the truth is not in us – 1 John 1:8). It is amazing to me how Christians are so programmed to think, say, believe and practice that they will always struggle with sin. Your quote of 1 John 1:8 was correct but the churches application of this verse is wrong. If we say that we ARE NOT SINNING, we deceive ourselves, and the truth is not in us. It is not you that I so much am disagreeing with, it is theologians who have convinced the church of a truth that is not there nor is it supported by scripture. Especially when you consider that Romans 7 is not Paul’s confession of his own personal struggle with sin. If we read just a little bit further we can see that John isn’t making a statement that Christians will always struggle with sin. He flat out says, if we say we have not sinned, not, if we say we are not sinning. 1Jn 1:8-10 KJV If we say that we have no sin, we deceive ourselves, and the truth is not in us. (9) If we confess our sins, he is faithful and just to forgive us our sins, and to cleanse us from all unrighteousness. (10) If we say that we have not sinned, we make him a liar, and his word is not in us. Just as Paul likes to point out, all men have sinned and fallen short of the glory of God, even the pious Jews. This is all the statement is saying. John later on, in his short letter, says that a believer who is in Christ does not sin. 1Jn 3:6-10 KJV Whosoever abideth in him sinneth not: whosoever sinneth hath not seen him, neither known him. (7) Little children, let no man deceive you: he that doeth righteousness is righteous, even as he is righteous. (8) He that committeth sin is of the devil; for the devil sinneth from the beginning. For this purpose the Son of God was manifested, that he might destroy the works of the devil. (9) Whosoever is born of God doth not commit sin; for his seed remaineth in him: and he cannot sin, because he is born of God. (10) In this the children of God are manifest, and the children of the devil: whosoever doeth not righteousness is not of God, neither he that loveth not his brother. How is it the church ignores the verse just under 1 John 1:8? How is it the church ignores these verses just a little further into the letter? The church misapplies and misunderstands 1 John 1:8. It is almost as if only Paul can teach that all men have sinned and fallen short of the glory of God. Christianity also has a very bad habit of ignoring the scriptures that teach contrary to their doctrine. Your first response was to correct what John wrote, and John took the time to repeat it in several ways in very strong language. It is as if 1John 3:6-10 doesn’t exist for the convenient excuse of the church to not be exposed to the true gospel, therefore never being changed by the true gospel. Don’t you struggle with these verses. Your interpretation of 1 John makes John out to be a man with two gospels in the same letter. Doesn’t this bug you? This is the gospel the church refuses to believe. Amen, brother. Your point is what the Holy Spirit have revealed in the reading of the gospel too. Very well written…..excellent point that those who call themselves Christian need to wake up and hear! Scripturally on point. I used to ask myself the scriptures can we be perfect as Christ as He commands us to be? Perhaps in line with this write up you could expound on how or when one attains perfection. Certainly for many Christians, who come to faith in Christ they may struggle with sin even though they now have a strong desire to change from the old ways and to walk with God and I hold my hand up here as this is true of me. So should one become perfect immediately on conversion is it a process? Is it that upon conversions we become mere babes in Christ and we work our way towards spiritual maturity? Is this when we attain perfection? I am sure these are burning questions for many reading this but who are afraid to ask. Good to have you come back an visit again. I have dealt with your questions a little bit in the post Power of an Endless Life, which you have made comment on in the past. I also continue the thought in the following post call Fruit Basket Upset. Maybe, people could check them out to get a better understanding of how the gospel is supposed to work in the believers life. The key is, not to live in the flesh and convince people who are supposed to be Christians to follow the Law (Ten Commandments) which can control behavior but not change a man from within. The Key is to live in the Spirit which can, will and does change a man and by doing so fulfills the Law. However, I think the church believes it only has imputed righteousness and is not accountable to righteousness for the saving of their souls. This could not be further from the truth. I have made several post about scripture teaching only those who obey, those who do righteousness etc will be saved. The hope held out in the gospel is only for those who actually believe and are born again. Not for those who believe and are never born again by the power of the Spirit. The church teaches confess Christ and be saved. The gospel teaches become like Christ through the power of the Holy Spirit, become a new man in Christ Jesus and be saved. But this is the gospel the church refuses to believe. I know I have been away a long time but it is always a pleasure to share the Word with you. In my reply above I meant to say, “I used to ask myself the question and not “scriptures”. What I do know though is that we can only be made perfect after the Spirit but not so in the flesh. The interesting thing as well is that even Paul who was a “seasoned” elder brother in the faith said in Phi 3:12-14 that he had not yet obtain or already become perfect but it was something he was still striving towards. I guess this is the case for many of us as well. if is that so ,that means everyone will go to hell because with your eyes we can sin and that tell me WORK HAS NOT BEEN DONE.ONE THING I KNOW IT IS GOD WHO JUSTIFY. Have you never read how God keeps His covenant of love with those who fear Him and keep His commandments? Those who want to be a believer and live in sin do not fear God nor are they keeping His commandments. Instead of quoting your calvinistic sound bytes, why don’t you prove from scripture that I am wrong. Otherwise you are a drone only droning on about what you are told to believe. To much is at stake to hing everything on sound bytes. And shall cut him asunder, and appoint him his portion with the hypocrites: there shall be weeping and gnashing of teeth. I only know that weeping and gnashing of teeth is referred to as being in hell. Bravo glasseyedave. Once in a while someone like you comes along and gives me hope that the church still might be out there. Bravo to you for understanding the gospel.